Long time supporter of all things BMX and freestyle, Standard Bykes is pleased to announce that we have signed pro flatland rider Joel Schallhorn as the newest member of the Standard Bykes Team! Joel will be the newest enlistee into the Standard Army and continue a long history of some of the best flatland riders ever to ride. A history of riders that at one time included such names as Paul Osicka, Chad Degroot, Chris Young, Bobby Fisher, Phil Dolan, Trevor Meyer, Lee Musselwhite, Dylan Worsley and countless others. Joel will be the first flatland rider on the Standard Bykes Team since Paul Osicka and will be working with Standard to design and produce a flatland frame and other parts in the coming months. 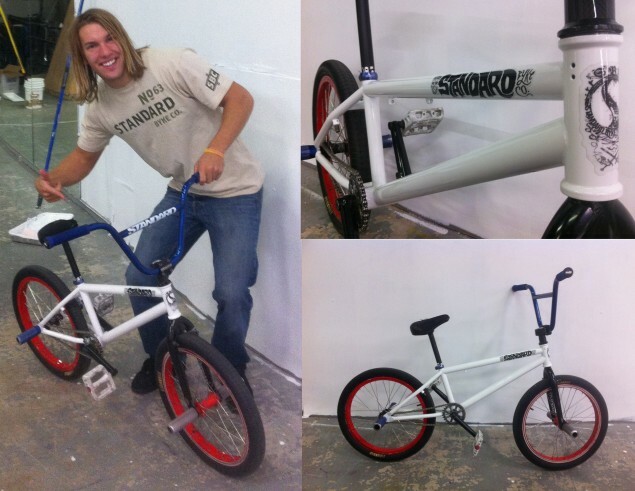 “We are really excited to have Joel on board as a new flatland rider. We love flatland and have some great stuff we will be working on over the next year. We can’t wait to get started!” ~ Rick Moliterno. Currently Joel will be riding a stock Standard Bykes 250L frame with two piece Standard Strip Bars from our street/park line while Standard and Joel work together to design a flatland specific frame along with other flatland components. A welcome edit is, of course, forth coming. Look for the Standard Army to invade the flatland arena in the next coming year with Joel Schallhorn leading the onslaught at contests and jams. Welcome to the team Joel! For more information on Standard Bykes products, go to standardbyke.com or contact us at info@standardbyke.com or (563) 323-4894.